We are hosting a Friendsgiving this weekend and a bunch of family for Christmas next month and while I’m overall pleased, content, comfortable, happy (!!) with the state of our home now, finally, after 5 years of renovating–there were a couple small things that I wanted to add/do before we welcome guests. The first was adding a good, proportionally sized lamp between the chairs in the living room. You may remember a couple months ago I gave the living room a make under and removed the very oversized lamp that was here, among other things. We lived with it bare for awhile, but I missed having a cozy glow on this side of the living room after the sun went down. However, I knew that I wanted to keep things minimal and clean and that just meant finding the right lamp. Sometimes we fill our spaces with things in an effort to make it look a certain way, but I’ve learned that one right thing can do the same job. This table lamp from Rejuvenation was just the ticket. Like, I don’t think I could dream of a better lamp for our living room. It comes in a few different combinations, but I chose the white oak to offer a lighter, warmer wood contrast between our two, darker leather chairs. It also ties in perfectly to the frame of our large art and the dining table. A tip on mixing wood tones: First, you totally can! I just shoot for layering a light, medium and dark. 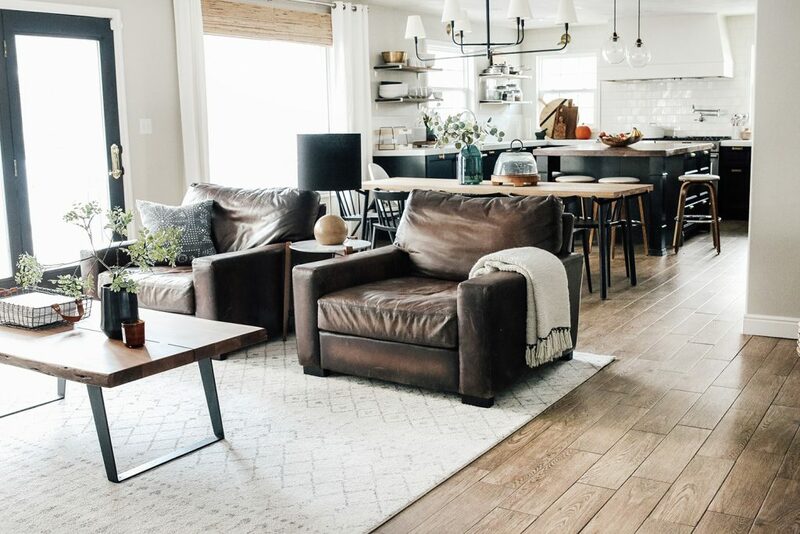 In our living room, the light wood is the lamp and frame and blinds, we have a medium in our coffee table and floors and the leather chairs, although technically not wood, bring in a dark rich wood tone. 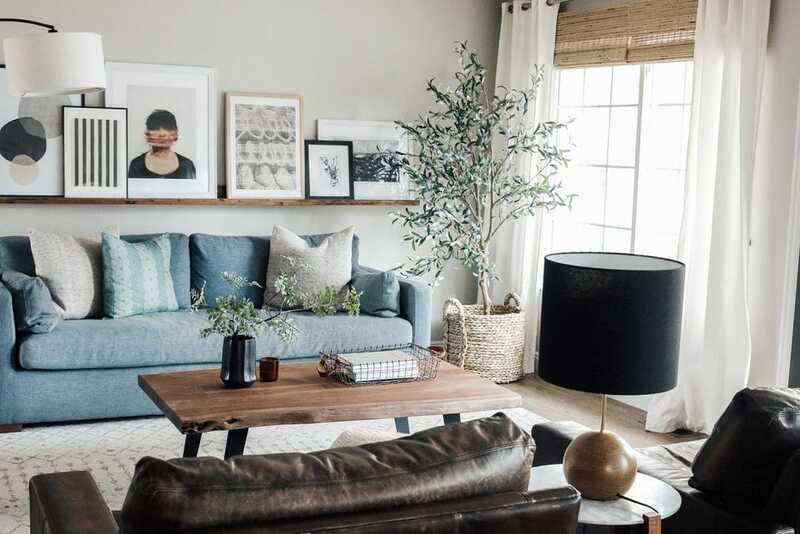 If you want your home to feel more cozy, add a lamp and also a good, chunky textural throw. I like to stay neutral with throws and let the texture play the role of interest. 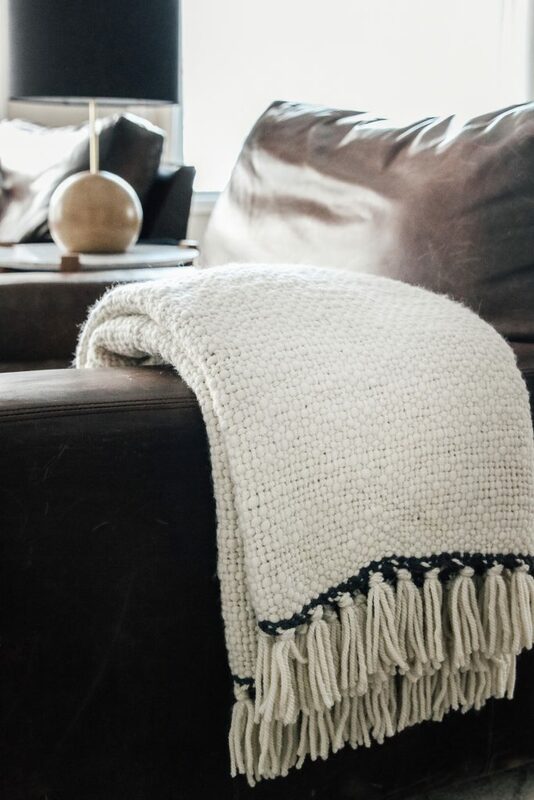 I found this chunky wool throw (it comes in 3 colors, I got the ivory) from Rejuvenation and it’s practically begging our whole family to cuddle underneath it and read a book together. It has a great weight to it, is impossibly soft and adds a layer of coziness to our living room that we were missing. 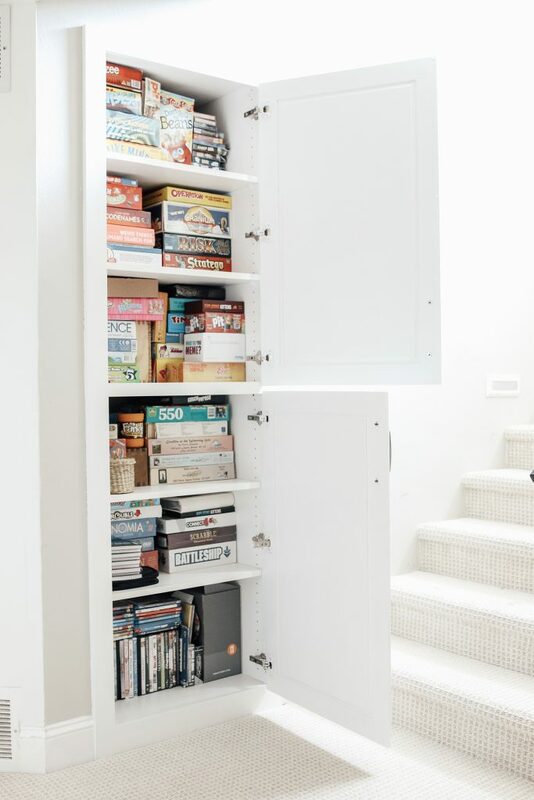 The last task on my list, that’s been on my list for 5 years, was the game cupboard at the bottom of the stairs. Many, many, many people asked about it in our latest home tour video–wondering why we haven’t painted it, saying it was taking away from the rest of the tour and even that they couldn’t focus on anything else. Haha! Our 90s honey oak cabinet is obviously original to the house and if you’re wondering how or why that I haven’t touched it in all of these years, I wish I could give you a better answer other than I just never got around to it. It’s not a part of any room and although we use it nearly daily–I just kept ignoring it I guess. No longer! Especially since board game season is among us, I knew it was time to take action. A quick paint job (I painted it White Dove by Benjamin Moore in a satin finish because we had it in the garage and it matched the trim—although I already kind of want to paint it a darker tone, maybe in another 5 years?!) and new hardware did the trick. The inside is stocked to the max with games, puzzles and DVDs at the very bottom (we actually don’t even own a DVD player anymore, just in the car, so these are more relics than anything else. But also remember when everyone had a DVD bookcase displayed in their living room?)! 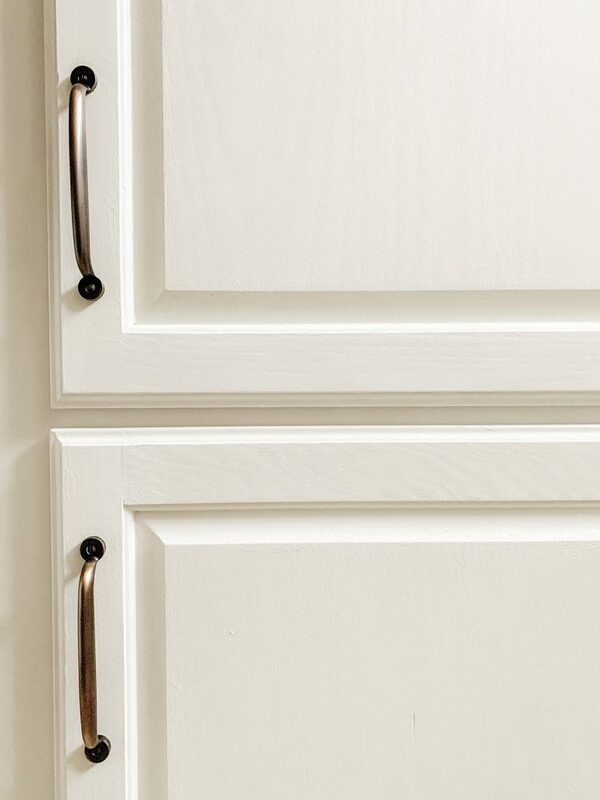 For the hardware, we used 6″ Massey Drawer pulls in burnished antique. They are a lot more proportional to the door size now and I’m finally not self-conscious about this landing at the bottom of our stairs. Why did I wait so long!? This update took under 2 hours and swapping the hardware took less than 15 minutes! 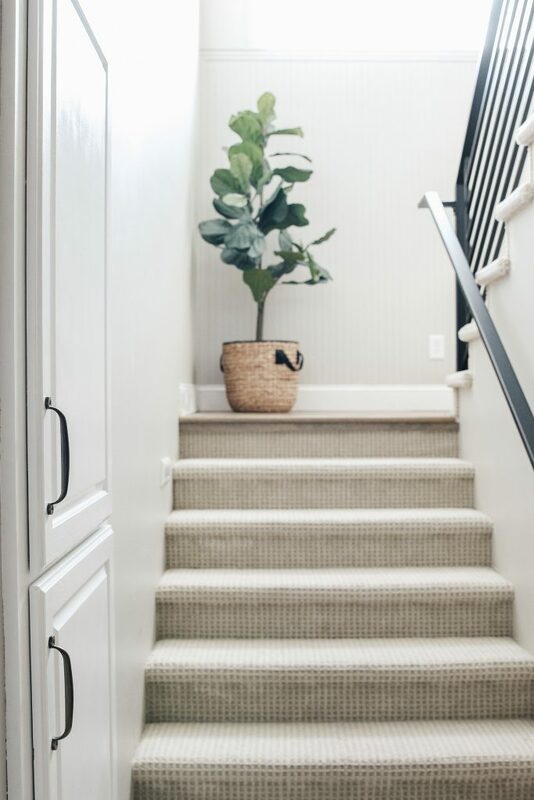 If you aren’t happy with the hardware in your bathroom or kitchen or dresser or a random cabinet at the bottom of the stairs–it’s an easy update and major upgrade that can completely change the look and vibe of your home. Any projects on your pre-holiday checklist? I think we’re officially ready! Hi! The updates look amazing. 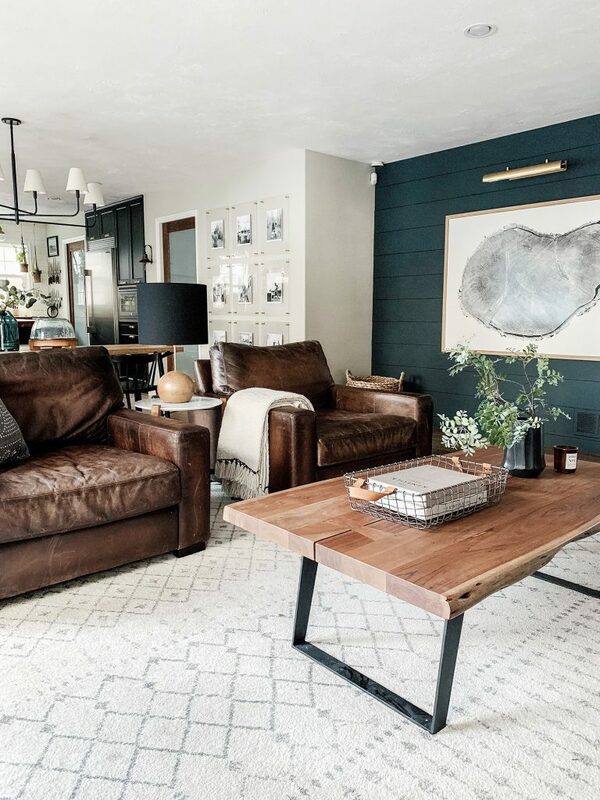 Can I ask where those amazing leather chairs are from? You can find all the sources to our living room right here. Is the rug from rugusa? They sell it just about everywhere! Here’s the link on Wayfair! this might be a dumb question but where is the lamp plugged in?! that’s why all my lamps end up being by the walls — so the cord isn’t crossing the room! I shared our lamp hack on my instagram story and saved it to my highlights! I’ve been trying to find the source within your site, but the basket containing the fiddle leaf fig on your stair landing…where is it from? THANKS! I was way too excited to see the topic of this post — yay for re-doing the cabinet! Agree that a dark tone would look amazing, too. I love your living room and love those chairs, but I struggle with not having a foot rest. 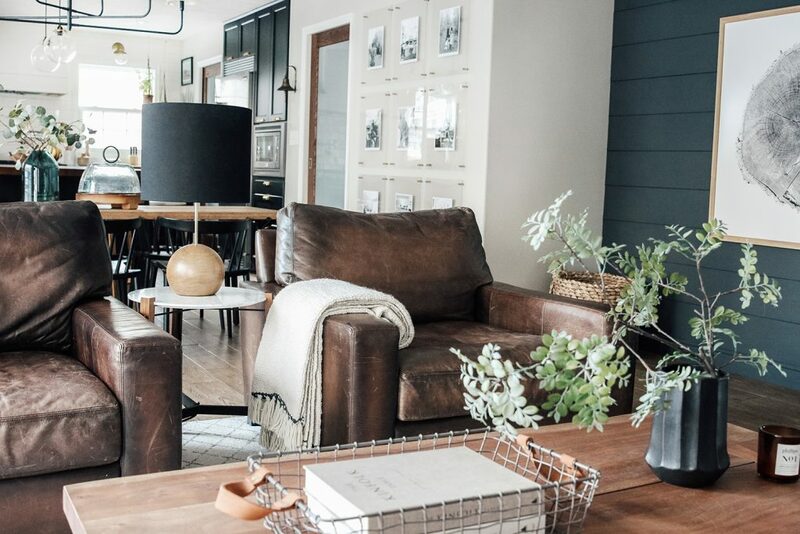 I’m moving into a house that could have the similar set up of furniture, but my husband would kill me if I didn’t buy some chairs with ottomans! Do you miss not putting your feet up? Our feet are always up on a coffee table or ottoman. We often put our feet on the coffee table! (We have real long legs over here), But there was a long period of time where I propped a footstool/pouf in front of the chairs and it worked great. Also these chairs are so large and lounge-y, we often curl up in them. I’m glad you finally tackled your game cupboard. :) I have a question for you. The honey oak cabinet color is exactly what we have in our kitchen. The plan is to eventually replace them and install new white cabinets, but we’re a ways out from that project. Would you recommend this paint for kitchen cabinets as well? What tips do you have on painting them yourself? I love the finished look! Your house looks so amazing! It all looks great! 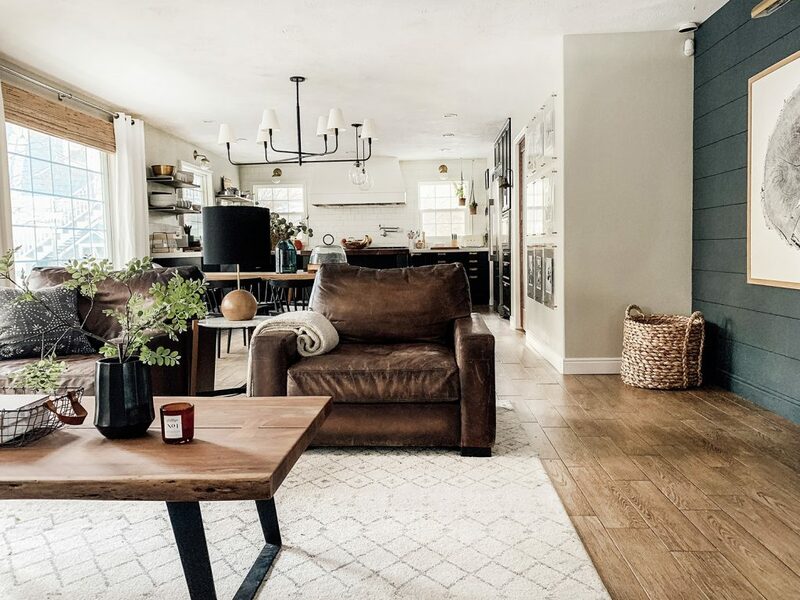 Love the whole cozy, moody feel of your home. Have you ever explained how it is that you don’t have DVD players anymore? I feel like I am always about 5 years behind on technology. Thanks for the help! It’s actually a pretty funny story. When they came out with BluRay players, I said, “nope! not buying all of these again! Let’s wait for the next thing.” And a couple years later, they started coming out with digital videos! Between Amazon and iTunes and the DVDs that we have bought that now come with a digital video file, we have a pretty robust digital movie collection that we can watch anywhere by either logging into our accounts on a Smart TV, our devices or the Watch Anywhere App. Hi Julia. Your living room looks beautiful! Sometimes the smaller changes make such a big impact. The vase on your coffee table caught my eye. Is the fern (?) in it real or fake? If it’s fake can you tell me where you got it? Thanks and keep up the inspiring work! I love it! Your home always looks great. I’m on the hunt for new board games to play with the family. I noticed you have a jam packed game closet. My kids are 11 and 14 and are tired of Monopoly, Sorry and Aggravation, etc.. What are your family favorites? My boys 12, 11 and 8 love Ticket to Ride, Dominos (Mexican Train), Sequence, Dominion, Catan, Kings of Tokyo. Oh, and Monopoly Deal has given us a fresh take on Monopoly. Do you have a step-by-step for painting built ins? We have an original 1973 built-in hutch…and we’re just not ‘formal’. So I want to remove the glass and paint it, but am super nervous about painting oak (you don’t paint solid oak, says everyone in my circle)! I’m wanting to go dark (BM Hale navy), walls are BM revere pewter). I’ve seen DIY cabinet paint jobs gone bad, that are chipped after a couple of years and really want to avoid that. Thoughts? 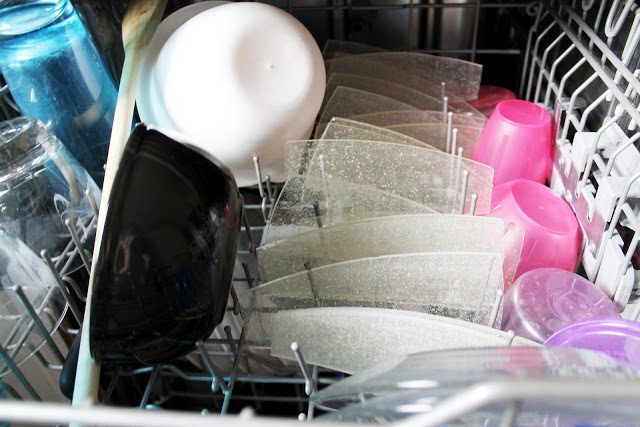 There’s a few steps that are essential: Make sure the cabinets are clean and grease free. Some good soap and water is good for this, I also recommend getting a deglosser and wiping it down with that. The deglosser will really get it paint ready, but going over it with a sanding block won’t hurt. Then wipe it down with a tac cloth and you’re ready for paint. 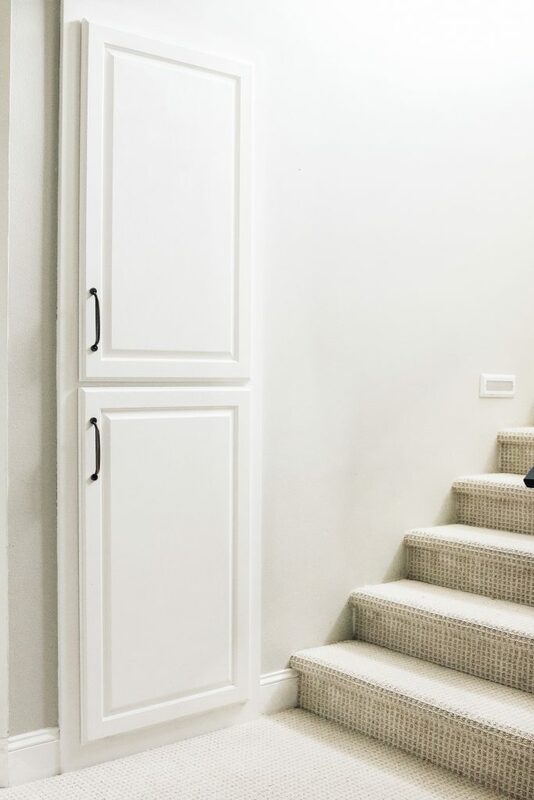 For this cabinet, we just used a good quality paint and primer in one, but if you want to go the extra mile, a layer of primer will ensure extra durability. I too have that honey colored oak cabinetry, but it’s my entire kitchen! I’ve noticed you’ve been drawn to the white oak lately. What do you think about a whitewashed (?) 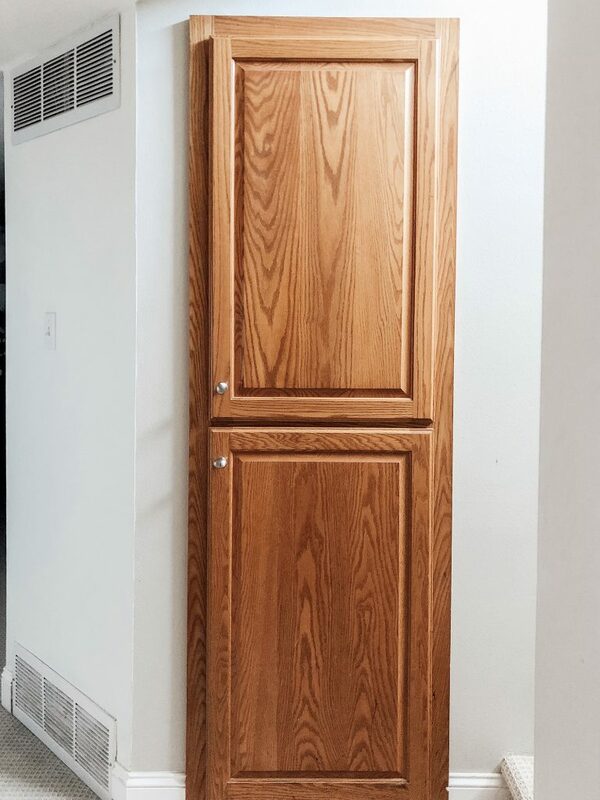 treatment for an update for honey oak cabinets? Yay or Nay? I’d love your feedback. I love it! 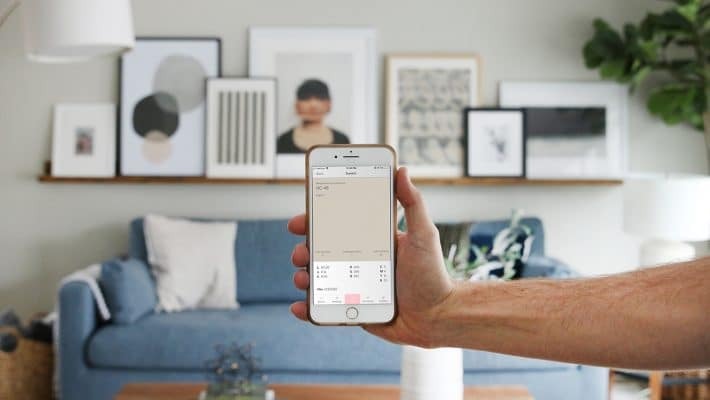 You may need to add a tint of gray because just a wash over those orange-y oak cabinets could go pink. But neutralizing it with a gray would be perfect. It looks amazing! Did you have to sand or prime first? I’m looking to paint dated wood trim/doors in our home as well and was wondering what kind of steps you took? I cleaned them really well, did a light sand, wiped it down again and then used 2 coats of paint and primer in 1. I loved the oversized gray/green lamp that was there before. I’ve seen it in other locations, and honestly I’ve been stalking online to try to locate it, but I believe its been discontinued. I’m in CA. Let me know if you want to sell it! I’m seeing if it fits anywhere at the Cabin, otherwise I may! How did you deal with the lamp cord since it is in the middle of the room? i.e. reaching an outlet & hiding the cord? Thanks! Great lamp. It belongs right where it is. Thrilled you knocked out the mismatched cabinet doors and it’s off your to do list. How did you deal with the lamp cord since it is in the middle of the space? I used zip ties!! I’m going to show how I did it on Instagram stories today! I filmed a little how-to while I was doing it. I love following along on Instagram. Your posts are so information plus inspirational. I have a question about mixing painted baseboards and stained baseboards/door moldings. Is there a method to the madness of mixing those? We are about to start a redo of a guest room/bathroom/utility room on one end of the house. I want painted baseboards, but the rest of the house has stained and I’m just not up (physically or financially) to redoing the whole house. Any suggestions? Take it a room at a time and approach each room with fresh eyes. If a space is all open, that should all be all painted or all wood, but if there’s a break or new room feel free to paint it. We painted our whole house 1 room at a time as we had the time, money and energy.